We are so far the only vendor that offers a single needle, so there wasn't any data on its use. We tried to recommend a schedule that we thought would be close to optimal, based on what we understand about skin regeneration. The reasons for recommending to use the dermaroller first is mainly that it stimulates the surrounding skin as well. Many things happen when you roll skin. You'll increase the bloodflow for quite a while (days), which increases oxygen levels, temperature and triggers certain very complex inflammatory responses that initiate skin regeneration. These processes are incredibly complex and one can drown in the details, explained in countless thick research papers. If you'd just single-needle the stretchmark alone, we thought that might be sub-optimal. However, we can't be sure of that. Nobody can really say they know. We know that the single needle works because we have customer pictures to prove it and the clinical data exists to back it up (that on scars and stretchmarks with hardened collagen, localized, exactly targeted longer needles work better than 1.5 mm needles or even 2 mm needles, due to selective crushing of scar tissue). We had one more reason for advising to use a roller first: Contrast optimization of the scar. We thought that if you would single-needle the scar only, without rolling, that there would still be a spurious boundary between the normal skin and the stretchmark. We thought that rolling first would help "blur" the stretchmark with the surrounding skin, by initiating an inflammatory reaction in both, triggering new collagen and elastin in both, creating a smoother transition between normal skin and stretchmark. We know someone who got good results by first using a very strong abrasive on the surrounding skin and then using a single-needle technique similar to ours. Using a dermaroller instead of an abrasive should be safer and give an even better result (because it goes deeper). So this is based on educated guesses, basically. You are free to think about this yourself and decide how you'd like to approach it. It depends also on how wide your scars / stretchmarks are, and how big the contrast with the surrounding skin is. So you are free to experiment - what we gave is just an educated guess. One year from now we'll be in a better position to make more definite statements. It is clear that "Baby Quasar" definitely does not induce any collagen formation. In my opinion, is a complete waste of (very much) money. There have been studies done that seem to corroborate their claims, but I do not put the slightest credence in that device of theirs, after having read their website thoroughly. Look at the "study" (anyone can claim anything and publish it as a "study", the only thing that makes it credible is where it is published, and "Seminars in Cutaneous Medicine and Surgery" is a glorified advertising rag. You'll see, when you read the abstract, that the idea and money for the "study" was put up by four commercial sponsors, all skin clinics. It would be interesting to find out whether one of the owners of those clinics also is the inventor/shareholder of the device or the company that makes it. The conclusion of their "study" is a joke. They claim to have found a "pulse code" that entices the skin to produce collagen, lol. You are free to believe whatever you want of course - by all means buy it, try it and I'm sure we're all interested in seeing a comparison between microneedling and that thing. The best evidence would be to do one half with a dermaroller/single needle, the other half with the "Baby Quasar". I will give you your money back for all dermarolling products you have ever bought from us if the "Quasar" works better than our dermarolling products. Since the invention of electric light, snakeoil salesmen have been selling gadgets with blinking lights, claiming they will cure just about any ill. Perhaps this is the first device that does what it promises, who knows. The only study they mention (but not identify or link to) is "Clinical studies in the U.K. revealed that the combination of red/infrared light (Baby Quasar) and blue light (Baby Blue) treatments provided the maximum benefit in treatment of inflammatory acne." Nothing about collagen! And they falsely suggest that this "study" used their products. The only light that can help inflammatory acne is UV (ultra-violet) light, because it kills bacteria. But the "Baby Blue" does not use the (very expensive) UV LEDs, on the picture on their site they clearly use ordinary visible-light LEDs, so their product won't even work on acne - let alone on scars, wrinkles etc. The picture on their site is either fake or they use white LEDs with a purple filter, because purple LEDs do not exist. I have delved into the publications that mention "mitochondrial antennae molecules" and the other terms they fence with, and it is all rather questionable. Even worse, the "Baby Quasar" is in fact a cheap, debilitated ripoff of the equally questionable invention by Dr. Robert Weiss. Perhaps the easiest way to debunk their claims is proving that their advertising is highly deceptive (a pack of lies). Look at this for example: http://www.cosmeticsurgery-news.com/babyquasar.html where it is claimed that the system is a "Home Laser" . Well - their device does not contain lasers, because even their own advertising material says it doesn't. Their device is just a cheap gadget with a few dozen ordinary LEDs and in materials it's worth about thirty bucks. But they charge a whopping 449 dollars. Look at how they market this thing: "Using technology developed by NASA for healing in space". Come on, do they really believe we're that stupid? from their FAQ, we learn that they're lying about how many wavelengths they "heal" with: Only red and infrared, making two wavelengths, not four. Red LEDS are the cheapest, perhaps that explains why they chose red ones. Infrared is nothing but heat, so they could just as well have put in an ordinary lightbulb or heating spiral. So this patented NASA "healing tech" is twelve red LEDs. The cheapest red LEDs cost 5 to 7 cents a piece, but the world's brightest red LEDs cost half a buck each. The same with infrared LEDs. So the device has at most twelve dollars in LEDs and a few bucks in additional electronics. The aluminum casing might be the most expensive component. The thing is nothing but the most expensive LED flashlight in the world. 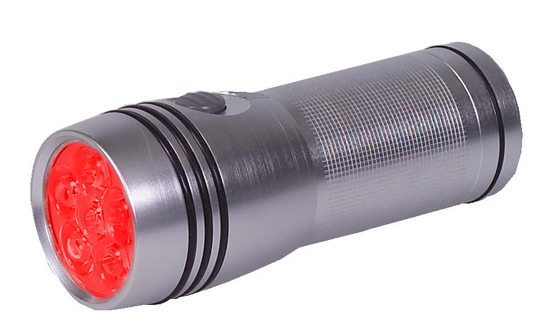 Here you go: For $ 19.95 you have an ultra-bright red LED flashlight with an aluminum case. No need for infrared LEDs - those red LEDs give off enough heat by themselves, especially if you press the flashlight to your skin. If you look further, in their FAQ they actually don't say it does anything specific for scars, stretchmarks, wrinkles etc. Nowhere they talk about collagen regeneration - of course, because there is no scientific evidence to back up such a claim, and since it's a US-based company, they'd get slammed for deceptive advertising. They only say in "How does it work": "The red and infrared light stimulates the human skin at the cellular level to increase the cellular level of activity. This, in turn, stimulates the body to build new capillaries and improve the lymphatic system, which are both essential to creating improved skin. The result is a younger, healthier looking skin." I also am very interested in specifically which NASA astronauts have used that "technology" for their "skin healing", in space.. If you want to improve your skin appearance you'll have to work at it and suffer a little - there are no magical shortcuts. For $ 449,- you can get a few year's supply of excellent dermarollers and skin products. Don't get duped by those scammers. Dermarolling is that "quantum leap", that amazing invention allowing you to greatly improve your skin with relatively little effort. If you would like me to post a dozen scientific articles that prove dermarolling works, I can easily do so. I invite them to do the same here. Blinking purple mumbo-jumbo voodoo "quasar" lights impress the impressionable but won't do a thing for your skin. It makes sense that skin produces new elastin and collagen when it's damaged. It does not make sense that the skin does that when you flash Morse-code onto it with a bunch of colored LEDs. LEDs are simply light emitting diodes, those are those tiny colored "lamps" used in consumer electronics for the past three decades. "Baby Quasar" says they use "NASA technology" and "four wavelengths of natural light", meaning at most, if we were to believe their claims (which have turned out false), they cobbled together some dime-a-dozen red, green, yellow and blue LEDs and conjured up some pseudo-scientific abracadabra. Four frequencies of light together = white light. Ordinary sunlight should therefore work just as well or even better than their device. But we all know from experience that it doesn't. Collagen- and elastin formation is caused by complex chemical changes in the skin, caused by serious mechanical damage to it. Blinking LEDs are quite literally not going to cut it. We read about their "SequePulse® technology" and frankly, it's hilarious. I'm sure they don't even believe it themselves. Copper peptides indeed have demonstrated positive effects and you can certainly try them. There are some ifs-and-buts and I plan to write a front page article about them soon, perhaps this weekend - thank you for the idea! A 0.5 mm roller will hardly induce any new collagen formation. 0.5 mm needles penetrate only 0.3 mm into the skin and that simply is not enough. >rest or should I add 2-3 weeks before my new rolling session? 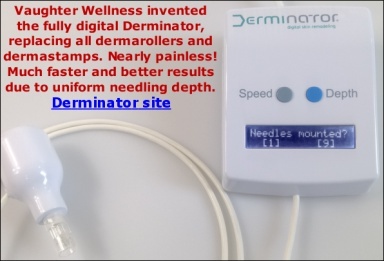 A dermaroller with 0.5 mm long needles penetrates only about 0.3 mm into the skin. It doesn't really reach the dermis and that's why it heals very quickly and you can roll once a week. 0.5 mm will improve the texture of the epidermis and is very good for product penetration. The thickness of the epidermis depends on where on the body the skin is. The epidermis on the eyelids is about 0.05 mm thick. The epidermis on the foot soles is about 1.5 mm thick. The face has on average about a 0.1 to 0.3 mm thick epidermis. Males have thicker skin than females. >and surgical scars but I' m a little bit confuse how to do it. Buy a medium-hard brush and dry-brush your stretch marks twice a week until they get red. Wait one hour (or less if the vit. C doesn't irritate/tingle your skin too much) and apply the vit. C serum that you prepare yourself according to our instructions. The other days of the week, mix salt or sugar with oil and scrub your stretchmarks until they get red. Wait some time and apply the vit. C that you prepared. Repeat this for at least 3 weeks. Disinfect your skin. Roll your stretchmarks or scars by doing up and down, left and right and diagonally with the roller. You might get some pinpoint bleeding - this is OK and a sign you're at the right depth. When you finish rolling, take a shower, air-dry and apply Infadolan ointment onto your rolled skin (a tiny bit of Infadolan is enough). Then start using a single needle on your stretchmarks and scars. You don't have to do that but it might further improve your stretchmarks or scars. You first disinfect your skin with alcohol or iodine (which has to be wiped off before rolling). Make very many pricks (= dense pricking) into your stretchmarks or scars with the single needle. Do not go deeper than pinpoint bleeding (about 2 mm deep). Do not prick the surrounding skin, only the stretch marks or scars. When you finish, apply a tiny smear of Infadolan. You only need a very thin layer. You can prick whenever you have time. You could prick ten to twenty stretchmarks per day. Do not prick the same stretchmark more than once a month. When you will have pricked all your stretchmarks at least three times, expose them to the sun. Pricking the stretchmarks might trigger melanocyte production and they may - if you are lucky - tan a bit. Normally, stretch marks do not tan because they have no melanocytes. Single-needle pricking will crush the hardened collagen bundles that are usually present in stretchmarks and it will also trigger new collagen production. It should improve their appearance. Continue applying vit. C serum but do not apply it just after pricking because it is acidic. Wait two or three days after the pricking. It is not realistic to expect that your stretchmarks will disappear. Stretchmarks are deep cracks in the skin and there is currently no method able to completely remove stretch marks (unless they are very shallow but they are usually very deep). You can significantly improve the appearance of the stretch marks with a dermaroller + single needle and make them a bit shallower, narrower and improve their color but you have to be patient. It is not going to happen overnight. Dermarolling / Microneedling / how about wrist creases? The only part of the body where a dermaroller cannot be used are the upper eyelids. However if the veins on your wrists or elsewhere are very near to the surface, then you must be careful with long needles and do not push them too deep. Skin creases in the wrist, elbow or elsewhere are formed by constant movements of the joints when the skin has to constantly stretch and crease. You cannot prevent crease formation but you can try to improve the skin texture and elasticity by dermarolling the skin and supplying it with vit. C and A. In addition you can buy vit. E capsules, prick them and use that oil on your skin and buy Panthenol spray or cream to supply the skin externally with vit. B5. Dry brushing the creases until they get red every now and then could also be very beneficial. You should also make a mixture of salt or sugar with oil and use that mixture to scrub your skin. You can scrub your whole body like that, scrub gently on the sensitive body areas such as the breasts and push harder in the hardened skin areas such as the knees, elbows or heels. After such scrub, use a 1.5 mm dermaroller. Scrub once a week and apply vitamins afterwards. Women's thinner skin brings with it that the same roller will cause more bleeding in female skin than in male skin. It doesn't mean rolling with the same needle length is less efficient for men though. The skin is not such a "thick" organ and its thickness varies depending on which part of the body it covers. All you need is to achieve is that your fibroblasts will produce new collagen. You don't have to go so very deep for that. Some professionals use 3 mm long needles but its benefit is controversial due to the fact that in a study pertaining this subject, all new collagen induced by rolling was formed within a depth of 1.5 mm only! A short period of skin redness means that your body very quickly and efficiently removed the damaged cells caused by rolling and hopefully it trigged the desirable processes in your skin leading to thickening of the skin and the production of new collagen. Vit. C has a half-l of four days so there is no need to put strain on the skin by applying acid to the deeply rolled skin (> 0.5mm). Trying to get rid of pigmentation is an exception. You should apply a high concentration of vit. C serum prior to rolling to ensure its maximum concentration when the collagen formation starts after the rolling and you should certainly continue applying vit. C after two or three days because collagen production will continue for months. Don't forget to wash your skin prior to the application of the vit. C solution, otherwise it will not be able to penetrate. You achieve the best penetration of vit.C in the skin by making a low-percentage of vit. C serum and apply it after a 0.2 or 0.25 mm rolling session or even roll the solution into your skin but it will sting. If your skin takes it well, gradually increase the percentage to a maximum of 20%. The Infadolan ointment has several roles when applied after rolling. It supplies vitamin A and D that are both fat-soluble and will penetrate into your skin especially when the skin has been dermarolled. The other function is occlusion by forming a protective barrier. It means it reduces oxidative damage of your temporarily vulnerable rolled skin. Occlusion also prevents bacteria or other pathogens entering your rolled skin. It also keeps the well-needed moisture in the skin by locking that moisture in and preventing its evaporation. That's why it is not good to roll Infadolan into your skin. It should stay on top of your skin and perform those occlusive functions. Don't worry: The vitamins A and D will be able to penetrate deep into your skin if you apply the ointment after rolling. You should only use 1.5 mm needles on the same area once a month. If you want to roll for skin care product penetration then you should roll with 0.2 or 0.25 mm. You can roll a skin care cream of your choice into your skin. Ointments should be applied after the rolling. Try to keep your cream as bacteria free as possible. Always wash your hands with soap before you touch the cream or take the cream out with some cheap disposable instrument (such as toothpick or something similar) or buy a cream in a tube. Dermarolling / Microneedling / Dermarolling a deep nasolabial fold? First of all, it is completely natural to have a nasolabial fold. Even children have them when they smile and some have them even when they don't smile. The nasolabial fold forms the border between the cheek and the lip. It's more or less the price we have to pay for smiling.. If you have never smiled in your life, your nasolabial fold would likely be much shallower but it would not be worth it would it? As we age, our nasolabial folds get more pronounced. One of the most common reasons is the change in the cheek mass and its support, principally the slow migration of cheek fat down the face. Some small additional causes are the atrophy of dermal collagen and increased skin laxity. Unfortunately, there is no way how a dermaroller could affect the muscle tone, volume and distribution of subcutaneous fat etc. A dermaroller can only affect the skin itself, not the fat and muscles underneath the skin. Obviously, if you tighten the facial skin by dermarolling it will likely reduce the nasolabial fold but it doesn't address the main cause – the drop down of fat and other structures under the skin. The advantage of the new collagen growth triggered by needling is that such induced collagen is your own and your body is not going to eliminate it. It will stay. Nevertheless you will continue to age of course and gradually lose "volume" in your face. Injectable fillers do wonders for an immediate effect but that effect lasts until our body metabolizes it and the filler degrades. That can happen as quickly as in 3 months. Long-lasting fillers can cause granuloma formation. If you desire a long term, very significant improvement of your NL fold, you would have to address the real cause and have a vertical lifting of the fold such as mid-face lift. > Also, which needle length should I use? You should stamp the fold with a 1.5 mm dermastamp with 35 needles. Stamp densely every three weeks. Pinpoint bleeding is the limit. Don't go any deeper. You could use a numbing cream. It might be red for several days so do not do both folds at the same time if you don't want to look like a clown. Alternatively, use aggressively a one line 1.5 mm dermaroller. On the second or third day, you can camouflage the redness with makeup (or with a sun block with lots of zinc oxide) but don't use any make up immediately after, and one or two days after microneedling. If you have a weekend off then prick on Friday evening and put on makeup on Monday morning. To tighten the facial skin, use a 1 mm regular dermaroller or longer. Dermarolling / Microneedling / How long does the inflammation stage lasts after rolling with long needles? > collagen development so we try to avoid LED's, Emu oil and NSAIDs afterwards. When you (for example) prick your skin you mechanically damage some skin cells. Those cells are too damaged to function properly and our body will immediately start removing those cells. It is the job of our immune system to remove pathogens, damaged cells etc. The capillaries will dilate and the whole area will get red from increased blood flow full of white blood cells and other cells that will be very busy, removing the damaged tissue and the growth of new cells will be triggered. Blood proteins will flood the area and that will cause swelling, the skin will get warmer than normal and will be painful. Inflammation is a sign that wound healing is in progress. Inflammation is caused by our own immune system. If our immune system didn't "flood" the area and didn't cause inflammation, our wounds would not heal. When you roll your skin, you induce inflammation (which is an immune protective response in order to fix the injury) but you should not get infection (bacterial or other contamination of the wound). Acute inflammation ceases when the acute injury is fixed and the damaged cells are removed. It takes a few hours (after dermarolling) and up to a few days (after deep single needling) but of course it depends on how deep and dense your pricks are etc. Basically, when the signs of inflammation (redness, swelling, increased heat, pain) are completely gone then the inflammation process is completed. It doesn't mean though that you should roll immediately when the inflammation from the previous rolling is gone. For reasons that are very complex, it is undesirable to have a more or less continuous state of inflammation of the skin. It is certainly not beneficial to your skin. You have to give your skin time to completely regenerate and give your skin time to complete several stages of collagen production (from collagen III to collagen I etc). The tissue remodelling can take months. > advice but the prices were totally out of my reach. Hyperpigmentation doesn't have an easy solution. It looks like you have quite sensitive skin because in-grown hair lotions normally should not cause hyperpigmentation (I do not know what ingredients your one had though) so I have to be careful with my advice. Usually, hyperpigmentation is due to locally excessive melanin production. Melanin is the pigment that determines the color of our skin and when our skin is exposed to the sun, the skin produces more melanin as a protection – melanin absorbs UV. Uneven/excessive melanin production can also be the result of skin trauma - burning, acne, cuts etc. Make a homemade vit. C ( it is a mild skin lightener and an anti-inflammatory) serum according to our dermarolling guidelines . Vit. C is a good antioxidant. Continue using it. People who do not have sensitive skin can try to dry shave the pigmented skin. Just use a new disposable shaver and shave the pigmented skin. The skin should be dry. Be very careful not to cut yourself. Roll with a 0.2 or 0.5 mm roller and use some skin lightening cream - for example Retinoic acid (start with very low percentage or dilute it and gradually increase. Do not apply it immediately after rolling but wait one hour. Later you can gradually shorten the waiting time between the application and rolling. If the pigmentation is too deep for short-needled rollers, use a 1.0 dermaroller (every 10-14 days). You will see if the pigmentation gets better. If your hyperpigmented spots are localized, you can make dense pricks into the pigmented spots (not to the surrounding skin) with our custom made single needle. The needle is very thin with a long taper and pricking the pigmented spots should result in intense peeling and new collagen production. You don't have to prick deep because pigmentation does not occur in deep skin layers. By all means - whatever method(s) you use, do a test patch first before you do larger areas. Your skin seems to be sensitive and you must first find out how your skin will react and how it will heal. in the sun immediately after rolling. Roll before going to bed and apply a high factor sunscreen in the morning. We have some customers who improved their pigmentation even with a 0.2 mm roller. This took about 6 months. The problem with pigmentation is that it is often caused by excessive melanin deposits and every time you expose it to the sun, the pigmentation will re-appear or get worse. Skin produces melanin as a protection when exposed to the UV (melanin absorbs UV). When there is locally uneven concentration of melanin, you end up with pigmentation. Uneven melanin concentration is frequently a result of injury, acne, inflammation etc.Freckles are also concentrated melanin spots. Dermarolling / Microneedling / Can small, shallow stretchmarks disappear entirely with dermarolling and single-needling? > Do you mean 100% removal or just so they aren't noticable at all? > completely if you are producing enough collagen. It entirely depends on how deep your stretchmarks are. Stretchmarks are usually very deep cracks in the skin that go through the entire epidermis and most of the dermis. The body repaired the cracks with scar tissue. Scar tissue is not unhealthy but it is a cosmetic problem. Scars typically contain a lot of collagen but that collagen is in the form of a scar and that scar tissue is usually atrophic (indented). Your basic technique should be to crush/abrade the hardened scar collagen bundles in the stretchmarks with this single needle of ours and that should make your stretchmarks look better. It will also trigger new collagen production and hopefully (and usually) some of this new collagen will be more like normal skin. I have never seen a deep stretchmark disappear but you have a very good chance (lots of our customers achieved this!) that the stretchmarks will look better. Needling should eventually make the stretchmarks less indented as well because needling will trigger the growth of new tissue. It is a very slow process and you will need many needling sessions to achieve it. Do not lose hope/faith/determination! This is not voodoo, micro-needling is a scientifically proven method - but if you want to be pretty, you have to suffer (and be patient). If your stretch marks are very shallow (which is rare, unfortunately) then after repeated needling you may have "abraded" the entire scar which will then be be replaced or at least partially replaced with normal skin. But - noone can guarantee this. Neither can I predict how much of the scar tissue will be replaced by normal tissue, if at all. Some of our customers achieved success and some haven't. The right technique is important, as well as persistence. Do not fall for the temptation to overdo it either. There are no shortcuts. The skin needs time, a lot of time, to properly regenerate. > "nappage" technique that is so fashionable over here in France? Mesolift is a method of injecting vitamins such as Hyaluronic acid or other substances into the skin and those injections reach a depth of 1 mm into the skin. Nappage is a form of microneedling where the skin is gently pricked, delivering droplets of vitamins, minerals and anti-oxidants into the skin. It's essentially the same as "mesolifting". If you roll your skin with a 0.2, 0.25 or 0.5 mm roller and apply some skin care products, they will be able to penetrate very deeply into your skin and you can achieve the same effects as a mesolift. It depends on the products that you use. I cannot comment on the efficacy of all the skin care products out there. Some people find certain products useful and others don't. Everybody swears by something else. It's very difficult to make an objective judgment. You basically have to try and find what works with your skin. Buy a cream with Hyaluronic acid (stretchmark creams often contain it) and roll it into your face or body with a 0.2, 0.25 or 0.5 mm dermaroller. Buy capsules of vit. E, prick the capsule and use it on your skin after rolling. Use (our) homemade vit. C serum frequently. Use our vit. A ointment after rolling or if that is too greasy for you, buy a vit. A cream. Buy Panthenol spray (vit. B5) or cream and use it occasionally on your skin (and hair). You don't have to use all these products simultaneously or every day. Just apply one of these products when you are in the mood, such as every two to three days. And every now and then, gently dry brush your skin. > tried a find a list of no-no's, but to no avail. There are hundreds of possible ingredients and I cannot comment on their efficacy or safety. It is the job of accredited laboratories to test these products and it is the responsibility of the seller to sell tested products only. I am sorry I can't be more specific. But be careful with homemade products. Since they normally do not contain preservatives and antioxidants they can easily get rancid or worse: Bacterially contaminated. The reason why we recommend making vit. C serum at home is because vit. C oxidizes easily in a watery solution and it is hard to make a (likely expensive) cream with a high percentage of stable vit. C. That's why you should make fresh, cheap vit. C serum yourself. > plumpness, but can it have an effect on sagging as well? Not by itself. You need longer needles to address skin sagging. Nevertheless, certain skin care products can help with skin elasticity and texture. At least that's what they claim.. If you have significantly sagging skin, not even dermarolling with long needles can fix it. In that case you'd need a face-lift. Repeated rolling can improve lost skin elasticity somewhat but it cannot fix significantly sagging skin due to aging or the presence of excessive skin. I see that you ordered the 0.2 mm and 0.5 mm dermaroller. There should be no long-term redness or no redness at all when rolling with such short needles. If your skin reddens with short needles, it should disappear within hours. Roll with 0.2 mm, in the evening before your day off and apply the skin care products of your choice. You will see how you look in the morning. It should be fine. I have never heard of anybody complaining about prevailing redness with a 0.2/0.25 mm or 0.5 mm dermaroller. Some creams contain those acids but the amount of acid in them is usually negligible and they should not make your skin red. If your skin is sensitive, do not apply acidic products immediately after rolling. Do not apply the homemade vit. C serum after rolling. Apply it some hours or one hour before rolling. Make your vit. C less concentrated and if your skin copes with it without reddening, add more vit. C into the serum. Our Infadolan regenerative ointment contains a form of vit A that is more "friendly" to the rolled skin - it is in the form of Retinol acetate which is slowly converted in your skin into Retinoic acid. Our vit. A and D ointment is oily (both vit. A and D are fat soluble vitamins) but very little is needed. You can apply a little bit it after rolling and spread it well.